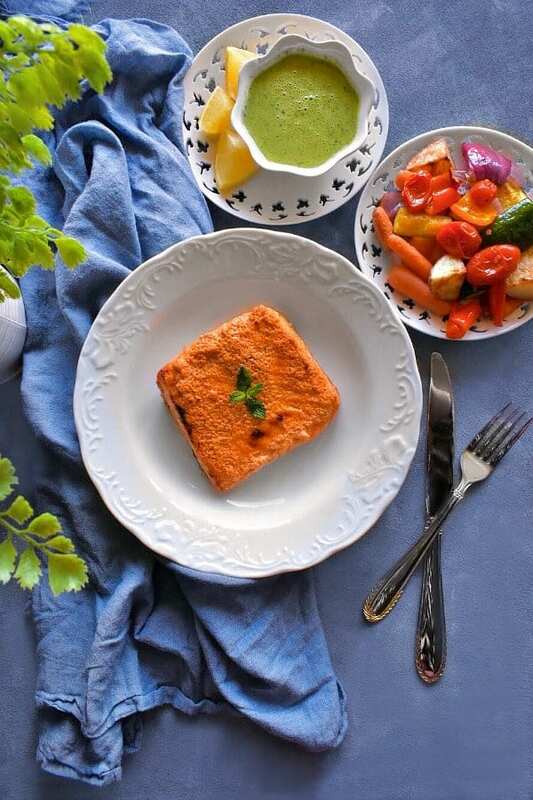 Quick Tandoori Salmon Recipe: restaurant style recipe that absolutely ‘melts-in-your-mouth’. 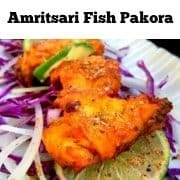 Made using homemade Indian tandoori masala that gives it a delicious rustic flavor. Quick Tandoori Salmon is Perfect for brunches. 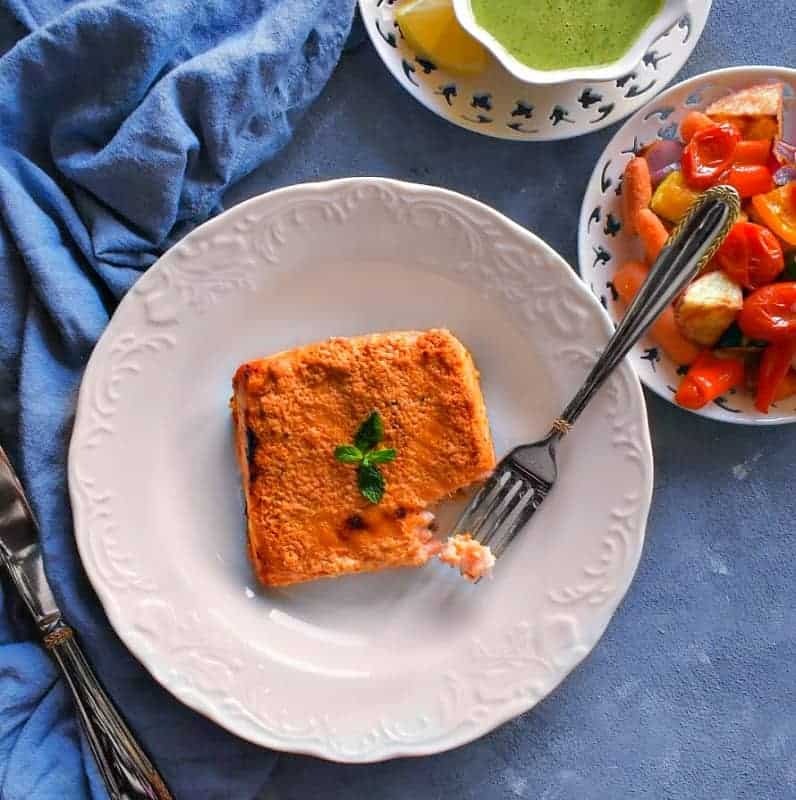 This Quick Tandoori Salmon Recipe is by far our FAVORITE recipe using salmon and also for date nights. 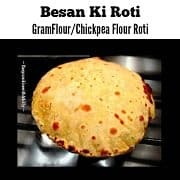 It has just the right hint of spiciness along with some tartness from lemon and literally melts in every bite. You can Make it ahead of time and serve with choice of side. 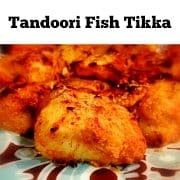 Seriously, 10 minutes is all you need to mix, prep and marinate these gorgeous fillets with a quick homemade Indian spice mix called ‘ Tandoori Masala’. And your lovely Tandoori Salmon Recipe is ready to bake. 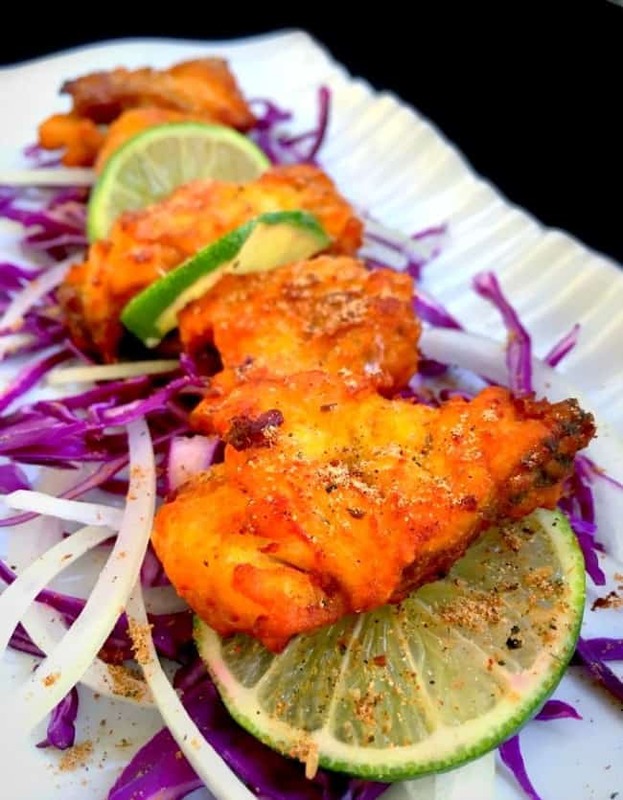 Now, if you’re a fan of Indian cooking or have eaten at any North Indian restaurant, you must have come across the term – Tandoori! All ‘Tandoori’ recipes are spiced with an orange colored spice+yogurt marinate and cooked in a clay pot deep oven called ‘Tandoor’ in India (hence the literal translation tandoori). Now as in these modern times, we seldom have tandoors at home (seriously takes 40 minutes to prep a tandoor using coals). So I’ve improvised and used a bake+broil method to get similar texture with our sweet home ovens. Also, I made the tandoori masala at home however, you can find them really easily in any Indian grocery stores. They are usually in the spices aisle and there are some really great brands (if you need suggestions, drop me a message below). 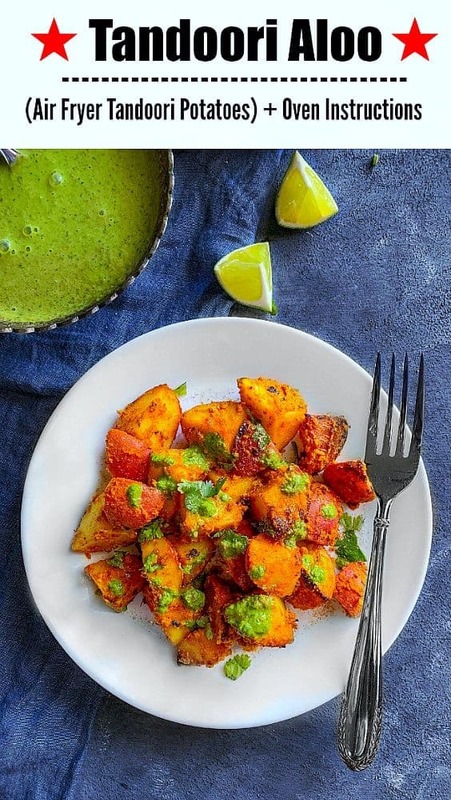 This masala/spice-mix is really very easy and you can make a huge batch and keep for later. But I can definitely go on and on about its taste. 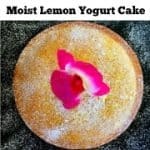 So, I’d rather take a leave and let you make this ASAP and try this deliciousness for yourself. It’s also featured many times on our Valentines Day meal too, so go ahead and give it a try. In a large bowl, mix yogurt, ginger+garlic paste, lemon juice and all spices together. Line a baking tray with foil and spray cooking oil.? 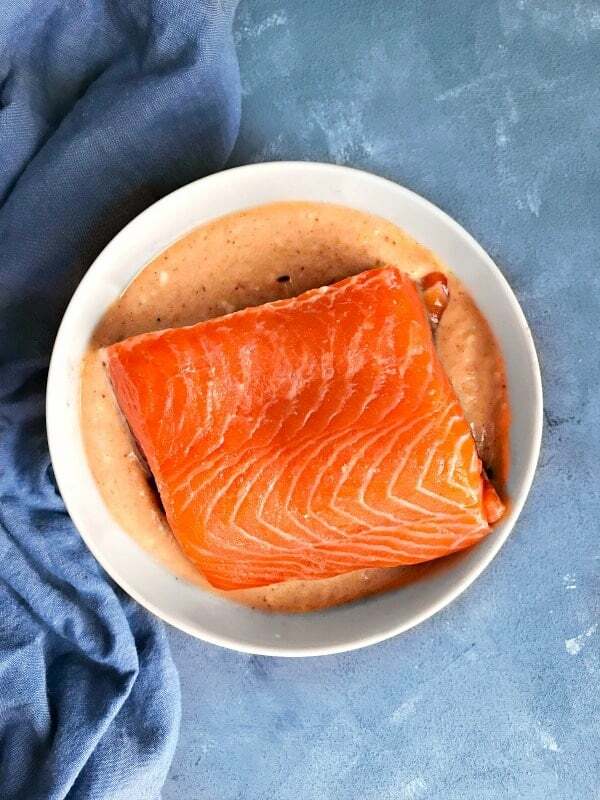 Place the marinated salmon on the tray and bake for 15 minutes in the oven. Then turn up the heat to a broil and cook for 3-4 minutes until it starts to char on the surface.? KEEP an EYE as this can burn quickly. Turn off the oven and remove the baking tray. 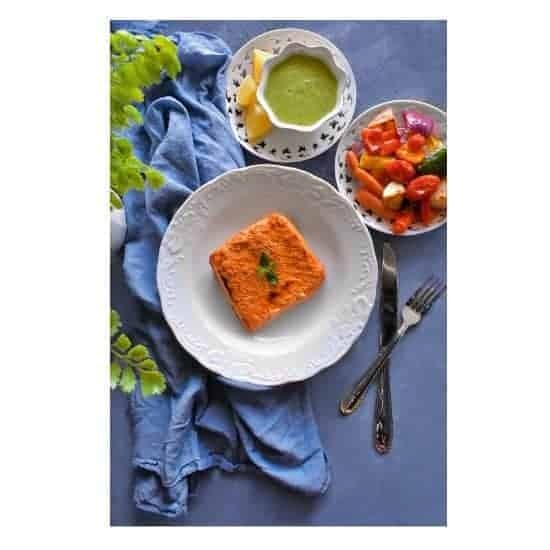 Transfer the salmon to serving dishes and serve immediately with mint chutney and vegetables. (You can serve this dish with any side of choice). 41 Replies to "Quick Tandoori Salmon Recipe (Glutenfree & Easy)"
I’ve baked salmon with butter, lime & garlic . It was not so interesting. 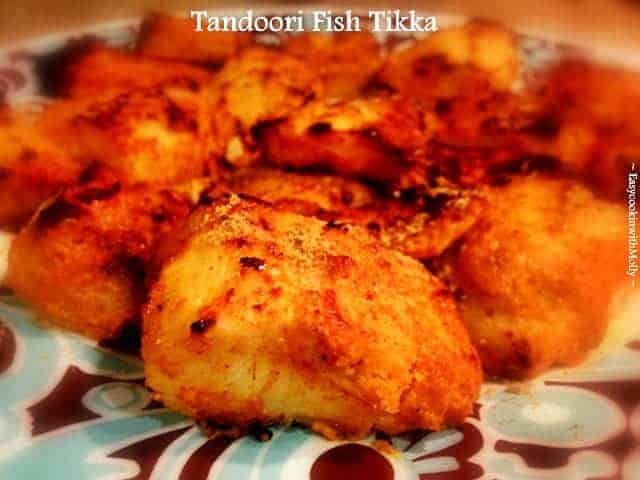 Thought of using Tandoori masala to compliment the delicate taste of salmon. We use tandoori masala regularly with chicken.Found your recipe online today & tried it. It was amazing ! 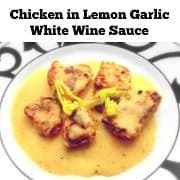 Will make it again when I have friends over for dinner!